UPDATED: Wed., Aug. 22, 2018, 7:09 a.m.
An magnitude 6.2 earthquake struck off the coast of Oregon early Wednesday, the U.S. Geological Service reported. 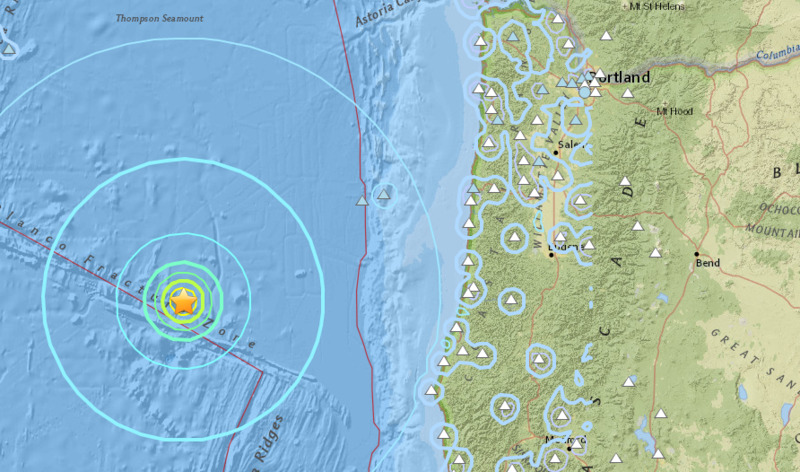 The quake, which was about 165 miles from land, was felt along coastal towns in Oregon as well as Salem, according to reports submitted to the geological service. It struck about 1:30 a.m. at a depth of about 6 miles. It did not trigger a tsunami warning. The Oregonian reported that no damage has been reported. Published: Aug. 22, 2018, 7:02 a.m. Updated: Aug. 22, 2018, 7:09 a.m.